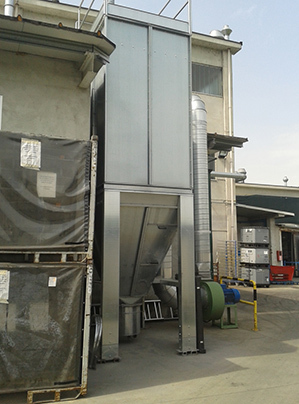 The bag filter mainly consists of a dustproof bag-holding chamber, a chamber for purified gas, a sealed dust collection hopper and a support structure in unified profiles. The needle felt bags are fixed to the hose band using an elastic metal ring incorporated in the fabric; the bag chambers are in metal wire and have a suspended, high efficiency nozzle included. There are no sealing gaskets or hose clamps on the hose band which is to separate the dusty air from the clean air. There are compressed air distribution hoses in the purified gas chamber, one for each row of bags, supplied by a series of diaphragm valves complete with solenoid valves and controlled by an automatic detection system of loss of full charge of the filter managing the washing of the bags. There are no internal moving parts. The dusty gas enters the filter from the hopper where the largest particles drop immediately; the finer ones rise with the gassy stream, and are uniformly deposited on the external surface of the bags. 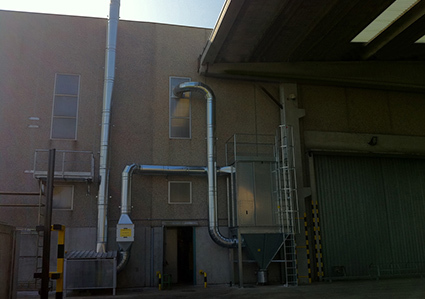 The purified gas reaches the clean area through the fabric and then the atmosphere. The dust captured on the external surfaces of the bags is removed by periodic jets of compressed air which, injected into each bag and aided by internal nozzles, generates a pressure wave that causes the expansion of the filter and then the detachment of the dust sticking to it. The times and methods of injection of the compressed air are managed automatically by a programmed modular system which operates depending on the predefined loss of charge with savings of energy and compressed air consumption. Where dust has to be reduced both for anti-pollution and product recovery purposes and, as a result, it is adopted particularly in the chemical, plastic, mining processes, metallurgic, food industry and glass sectors. 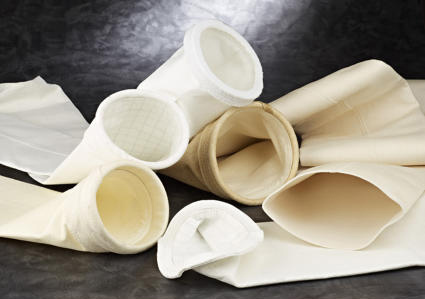 The wide range of modular system filters makes the bag filters easily adaptable to many capacities of air or process gas. The way the filters are produced and the technical choice of the fabrics used for the bags gives the greatest operational guarantee.